Casa Loca is perfect for guests who want to enjoy the finest Key West has to offer! The perfect location, less than one block from Duval Street, this 3 bedroom, 2.5 bath house will amaze you with its extraordinary decor and attention to detail. 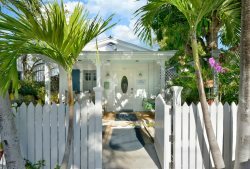 Sit on the fabulous island style porch and enjoy the classic Key West scenery. As you enter the main two-story house you are greeted by a large open floor plan with Greek-style columns defining each area. The entrance level hosts a comfortable sitting area with a Queen sleeper sofa and adjacent half-bath. Across is a spacious breakfast nook with a large window peering onto the front porch. Just behind is the kitchen, which includes a double door refrigerator with ice-maker, dishwasher, glass top stove, disposal, Corian counter tops, and marble back splash. Light pours into the expansive, luxurious step down Great Room through the 10-ft glass doors that surround the lush tropical garden. Hardwood floors throughout the home blend beautifully with the elegantly appointed high-end furnishings. Enjoy the six person formal dining suite just steps away from the stylish living room complete with a flat-screen TV, DVD player, and stereo system. You will appreciate the distinct details, including a backlit stained glass mural in the ceiling, which adds the perfect ambiance to this romantic space. Walk out the through the glass doors to your very own heated pool with hand-crafted stone fountain built in. Comfortable padded lounge chairs surround this tropical paradise with various assorted bromeliads, traveler palms, and tropical orchids. Equipped with an outdoor shower with solid wood privacy screen, and gas Weber BBQ grill, this outdoor living area is the perfect place to relax and entertain. Across from the pool area in its own private wing of the house is an airy, spacious, private master bedroom with French doors that open up to the pool/garden area. This room features a high-quality Serta king bed with down duvet, TV/DVD, ceiling fan, and intimate bath with marble shower. This large master bath with stunning glass block wall also features a full-size Maytag stack washer/dryer for your convenience. Upstairs in the main house are two bedrooms: one with a king bed and TV; and the other with a queen bed and TV/DVD. A tropically-infused large common area shared by the two bedrooms has cozy seating with a sofa and chairs, as well as a beautifully detailed full bath. Casa Loca is outfitted with the finest luxury linens, down comforters, and thick beach and bath towels. An iron and ironing board, central A/C, and additional room A/C units complete this exclusive, one-of-a-kind estate in the heart of Old Town Key West! Parking: If you have a vehicle you are responsible for finding your own parking. Pets: Pets are welcome; some size restrictions may apply. Parking in Key West is very limited. If you have a vehicle you are responsible for finding your own parking. The maximum people allowed in this property is 8. If there are more than 8 people are in your party upon arrival, your party will be asked to leave without compensation. Violation of ANY house rules will result in your party being asked to leave without compensation.